A Kreature designed for arctic ambush attacks. Its body secretes droplets of slime which it freezes into ice crystals, forming protective layers of hard-packed snowy armour. It burrows under the snow and lies in wait for a victim, then pops out and sinks its freezing fangs into them. 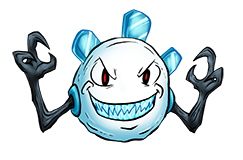 Groups of Snowble will work together to bring down large opponents, taking turns distracting the enemy while the rest inflict opportunistic bites.